SKH Weekend RoundUp: Pioneers, UFOs, Red Dresses and Crafty Artists | Stahancyk, Kent & Hook P.C. This SKH Wweekend is hot! Not only will the temperatures will be hitting some new heights, but there are plenty of activities to enjoy including a teddy bear parade in Oregon City, McMinnville’s always quirky UFO Fest, the smoking hot Red Dress Party, and Sunday Parkways kicks off this year in Southeast Portland. Have fun! The UFO Festival honors two locals who spotted UFOs, with a costume parade Saturday at 2 p.m., speakers, a movie, live music, a 5K, and kids’ fun at McMenamins Hotel Oregon in McMinnville. Pioneer Family Festival has a carnival, food vendors, entertainment, a police K-9 demonstration, and a Saturday teddy bear parade in Oregon City. The Teddy Bear Parade, one of Oregon City’s signature events, is a one-hour processional over a 1.10 Mile route. The Teddy Bear Parade gathers new teddy bears and stuffed animals that are given to law enforcement agencies, fire departments, emergency rooms, children’s hospitals and women’s shelters in Clackamas County. These stuffed animals are then distributed to children throughout our community who need comfort in times of crisis.Free. QDoc is billed as the only U.S. festival devoted exclusively to Lesbian Gay Bisexual Transgender (LGBT) documentaries, at Hollywood Theatre. Documentary as a form of expression is as vital and energetic as it has ever been, and QDoc brings the highest caliber of films – and their makers – to share with Portland audiences. 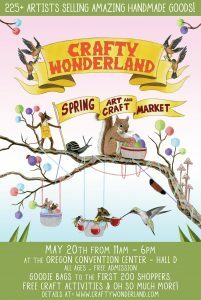 Shop from over 225 artists and craft makers at the Crafty Wonderland Spring Art + Craft Market at the Oregon Convention Center. Goodie bags to the first 200 people through the doors. Free. Men and women wear red dresses, drink red cocktails, and dance at the Red Dress Party for charity at the Old Freeman Factory. Red Dress Party: RED QUEEN! is annual party where about 1,500 men and women ALL wear red dresses, drink cocktails and dance the night away. This year’s Red Dress Party will benefit Bradley Angle and Q Center. The Red Dress Party is a 21 and over event only. Remember, you pay one price for an evening of fun, food, drinks and friends- And you must wear a red dress to attend this event! Visit local artists at two dozen locations on Mt. Tabor Art Walk, which showcases the many artists who live in this neighborhood. The walk is designed to promote high-quality visual art in a variety of media within the unique setting of this incredible Portland neighborhood.Free. Walk, bike, or roller-skate on 7 miles of streets when most cars are banned for Southeast Portland Sunday Parkways. Come spend a warm summer day walking, strolling, and rolling around Southeast Portland. This route will take you on a tour of Laurelhurst, Sewallcrest, Colonel Summers and Ivon Parks to grab a bite to eat, listen to tunes, and join some activities. Free.